It's Halloweeeennn! If you've carved your pumpkin & are wondering what to do with the pumpkin flesh - You're in the right place. A bit crap, I know! 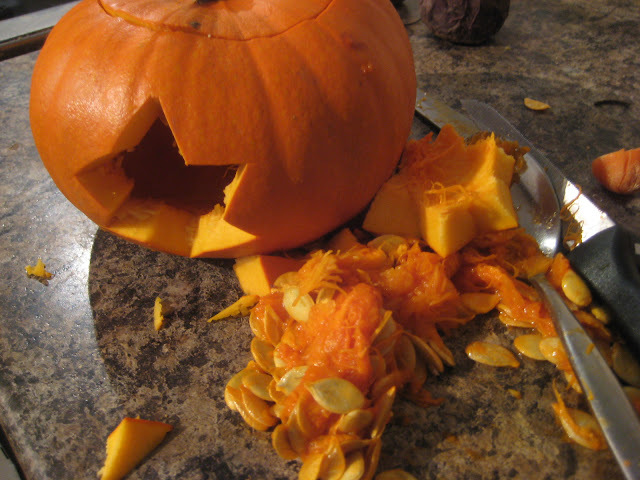 - I've been needing a lot of practice = a lot of left over pumpkin. Luckily Pumpkin soup is one of my all time favourite foods, but it's nice to be a bit more creative & this recipe is incredibly easy & makes a really nutritious alternative to bread. It's high in vegetarian protein due to the eggs & almonds and is packed with nutrients, from the calcium rich almonds, to the iron rich eggs, to the beta carotene rich pumpkin or squash. you could also add chilli flakes or coriander or curry powder instead of the mixed spice. Use what you have/ love. 1 Cook the pumpkin. Either by steaming, or cooking in a pan of boiling water until it is soft & tender. Alternatively you can bake it in the oven. Arrange in an ovenproof dish, drizzle a little light olive oil or other cooking oil over the top, then bake at 180c for about 25-30 mins until soft & cooked. 2 Beat the eggs together in a bowl & then add the other ingredients. 4 Pour into a loaf tin or baking dish. ( I lined mine with baking paper, so that it's easier to get out. you could grease your tin instead). 5 bake in the oven for around an hour (180c) until it's firm to the touch and the top has begun to brown. remove from tin, leave to cool & then slice & serve. Happy Halloween everyone! .......................... " trick or treat?"